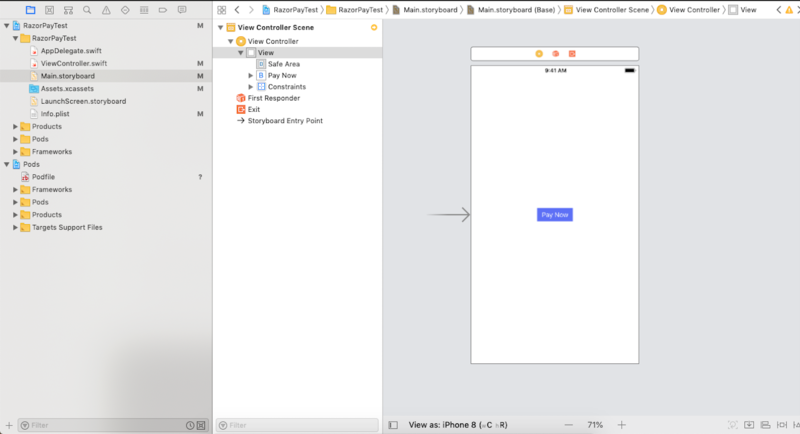 In this article, we are going to focus on Razor Pay integration with iOS Swift 4 using Xcode 10.1. and learn how to integrate Razorpay with an iOS app. Razorpay is one of the fastest growing payment solutions. It is robust and provides a developer-friendly API and SDK for Android, iOS, etc. It provides different modes of payments like credit cards, debit cards, net banking, UPI, and other popular wallets. In this article, we are going to focus on Razor Pay integration with iOS Swift 4 using Xcode 10.1. and learn how to integrate Razorpay with an iOS app. We will create a demo app to integrate Razorpay and pay some amount by using the Razorpay payment gateway. Add pod 'Razorpay-pod' in the pod file. Run ‘pod install’ from the terminal. Step 2: Develop a basic UI as shown below. Step 3: Import Razorpay to your view Controller. Create an action outlet of the pay now button in your view controller. 2. Create an instance reference variable of type Razorpay. 3. Initialize that reference variable in the viewDidLoad method of the view controller by calling the init method with the public key and delegate. "name": "business or product name"
To support the theme color in the progress bar, pass HEX color values only. Complete the Demo Project that you can download here. Published at DZone with permission of Chander Bhushan . See the original article here.